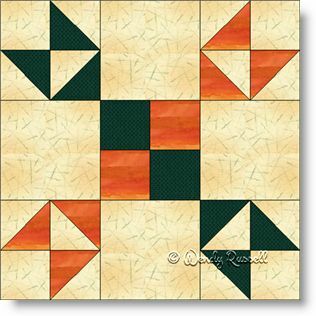 The Rio Grande Crossing quilt block is a nine patch block, which is probably the most commonly used one in quiltmaking. This block contains simple shapes -- only the square and the half square triangle -- once again, favourites of quilters. This block is by no means difficult, but due to the number of seams, you will need to pay close attention when sewing your quarter inch seam allowance, so that the pieces go together smoothly. The sample quilts illustrated give you some idea of how different you can make a quilt by using the same blocks. Since the block is somewhat directional, then simple rotations of some of the blocks can yield a secondary pattern. Adding extra blank blocks gives you the opportunity to increase the use of colour and also to showcase your quilting skills.